For a democratic secular Iran. For peace and prosperity in the Middle East. : Where is a foreign country? Where is a foreign country? 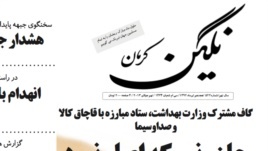 Last week, "Negin-e-Kerman", a local publication in the Kerman province in Iran, was banned. Hamid Eshaghi, the interrogator for branch 3 of the Kerman revolutionary court said the publication was banned for "Insulting the sacred values, propaganda against the Islamic Republic and perturbing the public's thoughts". An article that was published in the form of an essay, titled "Where is a foreign country?" was deemed as an insult to the holy Koran, Islam and the Martyrs". The essay was in fact a lampooning of the Islamic Republic's propaganda on how everything is fine inside Iran and how the foreigners are always suffering because of their misguided way of life. A foreign country is a place where they all have AIDS. Whereas in our country, everyone is faithful to each other. A foreign country is where their leader has more than one set of clothes and therefore they are very pompous and affluent. They also all wear neck ties which everyone knows is a sort of a sign and an arrow pointing to "below the belt" part. But here in Iran we are always very polite and always ask about the well being of each other’s families. We have everything in Iran, bread, housing and according to some, we have freedom too. The only difference is we say we don’t have these things ourselves but our officials say we do have them, but we are so nescient that we keep asking “so where is it?” Our officials are then forced to set up morality police units and force us to understand that we have all these things. But its not like this in foreign countries, because they are so illogical. Foreign country is a backward place where they have no morality police and they don’t get fined for wearing nail polish. In foreign countries they still haven’t understood that black is a suitable colour for summer. Because foreigners have a very weak religious and spiritual mind set, when they see strands of female hair, they are not provoked and they show no reaction. But if we see a few strands of female hair, we shake and shiver, because we have deep religious convictions. Because foreigners are so uncultivated and irreligious, they have no idea what temporary marriage is and because they are so effeminate they think men and women are equal. They have never had a decent and noble teacher to make them understand that a man, is in fact, equal to four women. They are so unrefined that when they walk into a church they walk with their shoes on and burn incense, they have no idea that the joy of speaking to God is in the sweet fragrance of old socks mixed with rosewater. They sing their prayers with music, because they are such donkeys that they do not realise when man speaks with God, he is not permitted to be joyous. God is very frightening and only Iranians know this. Our conclusion at the end of this essay is that a foreign country is a very bad place and a foreign country is where every one has AIDS. I am sure authorities rightly objected to the claim that i foreign countries everyone ha AIDS. I live in a foreign country and I can assure the writer that not everyone here suffers from AIDS yet. The publication should immediately retract that statement.